Manchester City robs Everton defender with £50 Million – Kenyatta University TV (KUTV). All Rights Reserved. The England international defender has signed a six-year deal which will keep him at the Etihad Stadium until at least 2022. Stones, who will take squad number 24, becomes City’s eighth signing of the 2016 summer transfer window, following in the footsteps of Ilkay Gundogan, Nolito, Aleksandar Zinchenko, Aaron Mooy, Leroy Sane, Gabriel Jesus, Marlos Moreno. “I’m absolutely delighted to sign for City and now the deal’s done I’m looking forward to the next stage in my career,” Stones said after signing the deal. “I’ve obviously seen what’s going on here at the Etihad, it’s an ambitious Club with a great manager so I can’t wait to get stuck in and help achieve the goals. “I know it will be tough getting a place in this team but I’m determined to become the best player I can be and help us to success. Manager Pep Guardiola echoed Txiki Begiristain, director of Football sentiments who termed him as “an excellent young English defender” and “pleased” that he was joining City. “We have worked hard to bring him to City and we feel we are signing one of the best central defenders in Europe,” he added. “We want to help John show his quality with us and improve on what he has already achieved. I like the way he plays the game and I’m looking forward to welcoming him into the squad,” Pep Guardiola said. Seen as one of the world’s most promising centre backs, over three years at Everton, Stones has built a reputation as a ball-playing, 21st century defender, equally adept at neutralising opposition attacks as launching the first key pass out of the defensive third. 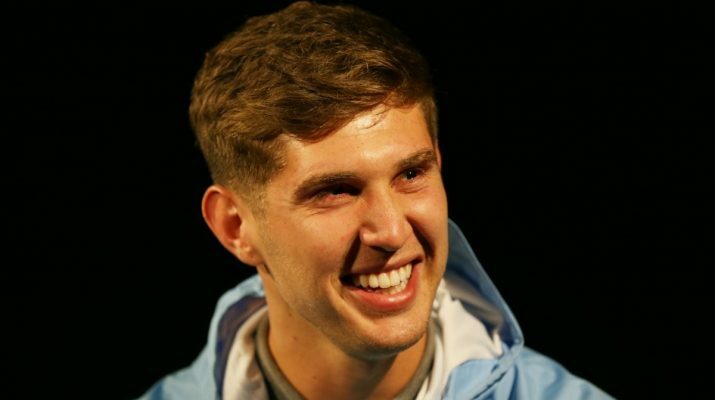 Stones represented England at u19, u20 and u21 level before making his senior international debut on 30 May 2014 in a 3-0 friendly victory over Peru at Wembley. He made his competitive debut for the Three Lions in the Euro 2016 qualifying opener against Switzerland where Roy Hodgson’s side got off to the perfect start with a 2-0 away win and John was included in the squad for the finals this summer. Rising up from the youth ranks at his hometown club Barnsley, Stones went on to make his professional debut for the Tykes against Reading on 17 March 2011, going on to make 28 appearances in total for the South Yorkshire side. A maturity beyond his years was evident in these first steps up the professional ladder, prompting Everton to snap him up on a five-and-a-half-year deal on the final day of the 2013 January transfer window. Stones didn’t make his senior debut for the Toffees until the following season when, on 28 August 2013, he appeared in the League Cup win over Stevenage and his Premier League bow followed a month later as a late substitute in their 1-0 victory against Chelsea. Stones joins fellow England internationals Joe Hart, Fabian Delph and Raheem Sterling at the Etihad Stadium.